These amazing natural wonders and epic elemental disasters of the world showcase both the most beautiful and most terrifying sides of Mother Nature. With hundreds of images and over one hundred paragraphs of link-packed information you will not find a more definitive collection anywhere online. Sectioned according to the four classic elements of earth, water, fire and air, here are 52 elemental phenomena and formations and 30 environmental disasters – and to round it off: 100 beautiful HDR photographs of the natural world. These four collections feature photos and videos of nature at her very best, illustrating the elemental beauty of the natural world below, around and above us through formations and phenomena at myriad scales. 15 Elemental Earth Formations and Phenomena: The most amazing natural land formations in the world are so huge they can truly only be appreciated from miles above the Earth. 15 Elemental Water, Snow and Ice Formations and Phenomena: This ubiquitous life-giving substance covers much of the planet but takes innumerable different forms as a liquid and in its solid state as ice. 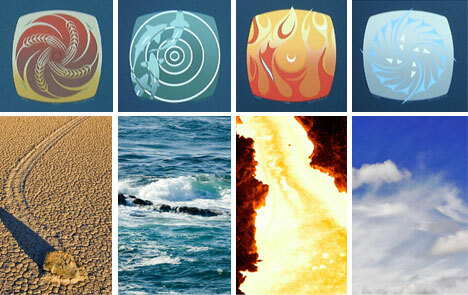 12 Elemental Fire and Light Formations and Phenomena: Heat, fire and smoke are known for their destructive capabilities but they can also be stunning and renewing seen in the right light. 10 Elemental Sky and Cloud Formations and Phenomena: From extremely strange cloud patterns to incredible plays of light and air, the sky is far from being the empty void above our heads and can an amazing source of inspiration and natural beauty. These four articles document nature at her worst and most devastating, capturing the awesome power of the elements in photo and video in the face of which we humans often find ourselves virtually or entirely helpless. 8 Devastating Earth and Land Disasters: The ground beneath our feet is supposed to be the most stable stuff on the planet – making earthly cracks, breaks, shifts and slides are all the more devastating. 6 Chilling Ice and Water Disasters: This planet-spanning bringer of life can just as easily take it away as water, snow or ice through floods, tsunamis and freezing ice storms. 6 Scorching Heat and Fire Disasters: From volcanoes to forest fires this element is known as the most destructive of the four and can be one of the hardest to hold back as well. 10 Sweeping Wind and Sky Disasters: Many of the most frightening natural disasters descend from above, from simple storms to hurricanes and tornadoes and everything in between. 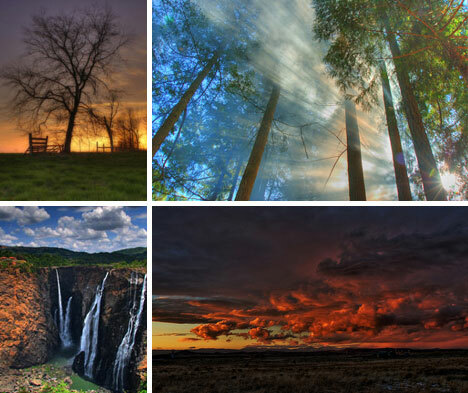 These four galleries show the potential of HDR technology to bring to live colors of nature we normally only catch at rare moments, if at all, with the naked eye and never with normal film processes. 25 Stunning HDR Nature, Landscape and Mountain Photos: This gallery exhibits nature at its very best and most beautiful with picturesque landscapes brought to life through the added layer of HDR processing. 25 Chilling HDR Water, Beach, Snow and Ice Photos: From waterfalls to floods, frozen rivers to snowstorms these images show the amazing potential and range of visual possibilities inherent in water and ice. 25 Scorching HDR Sun, Smoke, Volcano and Fire Photos: This set explores the relationship between earthly forms of fire and smoke and the airborne aspects of these elements through the sun and clouds. 25 Sublime HDR Sky, Weather and Cloud Photos: These shots show the deep and rich range of colors and textures that pattern our skies on still days and stir them to extreme forms during storms.